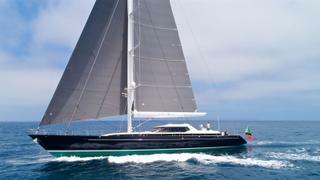 The 32.6 metre sailing yacht Eclipse, listed for sale by Michael Selter at Crow’s Nest Yachts in San Diego, California, has had a $610,000 price reduction. Built in aluminium by New Zealand yard Alloy Yachts, she was the first fruit of what became a long-standing association with Dubois Naval Architects and, ABS classed, was delivered in 1991. Accommodation is for up to seven guests in three cabins consisting of a master suite aft with a VIP suite to port and a twin cabin with a Pullman berth to starboard, all with entertainment centres, Sony television screens and en suite shower facilities. In addition, there are quarters for three crew aboard this yacht for sale. A comfortable and cosy saloon has relaxing seating, a dining table and chairs, and an entertainment centre including a 40 inch Sony television screen. In a testament to her abilities as a long range cruising yacht, her original owners spent 14 years cruising the world aboard her. In 2011 a refit included having her entire rig replaced while the interior and electronics systems were also upgraded and she was given a new set of Doyle ‘Stratis’ sails. A further refit in 2014 involved a complete paint job and her boom and rigging were fully inspected and serviced. Under power, a 452hp MTU diesel engine gives her a cruising speed of 12 knots and a range of 4,000 nautical miles at 10 knots. Eclipse is now asking $2,990,000.